thank you, again, for giving me the greatest gift ever...contact with the love of my life. I know I thanked you before a bunch of times, it is just....I can't explain...the message I have been asking of him since he passed....exactly, and...well...thank you. “A while back, October 2016, I had the amazing opportunity to receive a Healing session with this incredible person! I was skeptical, but hopeful, and went with an open mind and heart. Mark used healing bowls, tuning forks, and the most wonderful music in this session. I was blown away! While I know that each session is very individualized and experiential, it was amazing. I am not sure how it works, but it does! I left a changed person! I felt lighter and brighter than I had felt in years! Every time that I recall my session I am transported back to the intense feelings that freed me at that time and I am once again renewed. 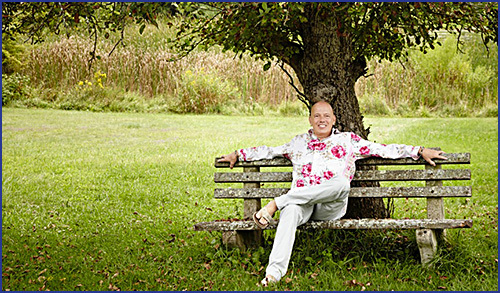 Mark is an extraordinarily gifted sound therapist and energy healer. He is not only extremely intuitive but he also works with the purest intention. He has extensive training and an incredible selection of instruments that allow him to tune in and address his client's greatest needs. My session was amazing. It began with Mark using sound therapy to balance my energy and to ease the physical discomfort I was experiencing. That alone was wonderful but Mark then facilitated what I can only describe as "an incredible shamanic journey" into another plane. I was gently lifted out of my body and carried by sound into the spirit world, where I was met with the open arms and beautiful smile of my dearest loved one. We reconnected in such a deep and profound way that brought unimaginable comfort and healing to me. My loved one even gave me a sign so that I would know that we were truly together - it was validated less than 3 hours later! My session with Mark has made a huge shift in my life and I am immensely grateful. Thank you so much, Mark! Having met Mark several years ago, I had been urging him to get on his healing journey as I knew that he was incredibly gifted, but after experiencing one of his treatments I'm lost for words. It has got to have been one of the most POWERFUL healings I have had in my life, and trust me I've had a few. From the moment that Mark started to unpack all his musical delights, I was in heaven. I zoned out and enjoyed the moment. He then continued after the session to share with me, insightful pieces of information that were specific and accurate to my life. WOW is all I can say. What a delightful and moving experience and one I shall cherish for the rest of my life. Thank you Mark you are a true blessing in this world." I am beyond grateful and can’t wait for my next session. So experiential that words are powerless. “I had the privilege of experiencing Mark’s sound healing work during a retreat at Blue Spirit in Costa Rica. We both attended the same intuition course, I as a stumbling beginner; Mark with his quiet knowingness. Reserved, kind; his eyes would always meet your heart with the smile that is only of very old souls. I have been living in pain for a time long enough to forget what it feels like to be in one’s own body and enjoy the experience. Over time I experimented with many energy modalities, every time putting myself afresh in the child mode of openness and wonder. Following my one session with Mark, to my happiest surprise, all pain dissolved for three wonderful days! I was calm, energised, rejoicing at my new freedom. It felt like coming home to myself in love and peace. treatment itself set the tone for deep relaxation, letting go, and peace. Feeling outside time and space. Safe and guarded. The healing power of sound! So widely recognized, now, that in some avant-garde circles it is thought of as the medicine of the future, as it was the cure since the beginning of time. “Sound is a carrier wave of consciousness” says Steven Halpern, and Jonathan Goldman speaks of the importance of ‘the intent’ behind the sound, the alignment with Source of the person making the sound. Mark’s connection to Source can be sensed as he works on you. It translate in the wonderful feeling of safety, peace, quiet joy; of being in the presence of your Higher Self. It seems to me that the extra ordinary healing power of Mark’s work resides in his intent, in the message he confides to the sound waves he produces with all his instruments: unconditional Love. So experiential that words are powerless. Mark is amazing, friendly and comfortable to be around. I feel so much better and more grounded. “I highly recommend Mark as a sound therapist and spiritual advisor. In a matter of minutes he intuited my imbalances and with the use of tuning forks helped to balance my energy and chakras. I feel so much better and more grounded. His sensitivity, compassion and professionalism enabled me to receive this gift. Thanks again Mark.